From August, workers and visitors to Canary Wharf are able to top up their water bottles on the go, thanks to seven new water refill stations installed in Canary Wharf’s shopping malls. The first station has launched in Canada Place, with new units also popping up in Cabot Place, Jubilee Place, Churchill Place and Crossrail Place. Each water refill station has a unique counter system tracking how many bottles are being refilled, with the hope that 100,000 plastic bottles will be cut from the community. These particular refill stations are part of a new breed of super-sturdy hygienic fountains supplied by British firm MIW Water Cooler Experts, which earlier this year helped establish the London Drinking Fountain Fund as part of the #OneLess movement. 38.5 million (Figure 1) plastic bottles are bought in the UK every day, but only just over half are recycled, while 16 million are put into landfill, burnt or leaking into the environment and oceans each day. Plastic bottles can take up to 450 years (Figure 2) to break down once they reach the sea. Many of the popular bottled water brands consumed in the UK are transported hundreds of miles from their source, contributing to the 350,000 tonnes (Figure 3) of carbon dioxide released into the atmosphere every year by the bottled water industry in the UK. 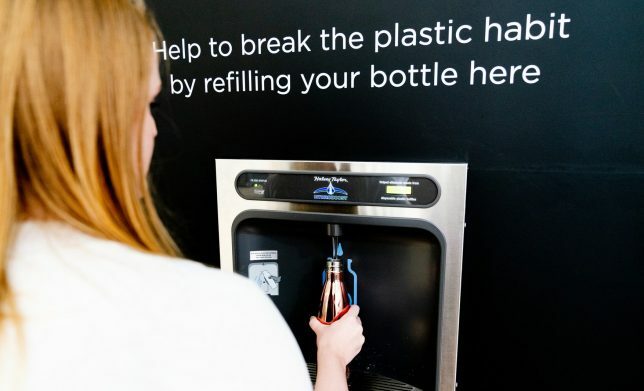 The water refill stations are part of Canary Wharf’s ongoing commitment to sustainability and the latest initiative in our Breaking The Plastic Habit campaign, which sees Canary Wharf strive to become the world’s first plastic free commercial community, an accreditation from Surfers Against Sewage.